Aluratek's Universal foldable smartphone and tablet stand will give your hands a break so you can enjoy reading, web browsing, watching movies, talking on the phone and other activities - all hands-free! 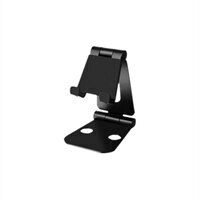 View your smartphone or tablet in landscape or portrait orientation and adjust the stand to the perfect viewing angle. Made with high quality aluminum, the stand provides solid stability and sturdiness for your smartphone and tablet. The foldable stand's base also features non-slip silicone pads and feet to keep it from slipping and sliding off any surface. The compact size and design makes it easy to travel with anywhere.